The southern part of Clapton (to be distinguished from Upper Clapton), it is within the London Borough of Hackney, in the E5 postal district. Lower Clapton extends mainly to the east of Lower Clapton Road, south of the Clapton roundabout and takes in Hackney Marshes and the River Lea (or Lee) as its natural border to the east. It borders Homerton to the south-east and central Hackney to the west. 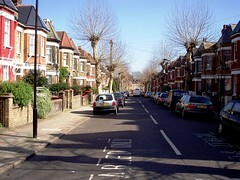 Apart from Lower Clapton Road, the main shopping street is Chatsworth Road to the east. It is not directly served by any rail stations (though Hackney Central Station, Hackney Downs Station, Clapton Station and Homerton Station are all short walks from the area), but there are many buses which travel along Lower Clapton Road. Last edited 2008-07-02 04:15:13 (version 7; diff). List all versions. Page last edited 2008-07-02 04:15:13 (version 7).